If you got a new phone for Christmas, you will love this new mobile phone accessory which was seen on Dragons’ Den – myBunjee® is an ingenious product which secures your mobile phone and prevents it from falling to the floor! 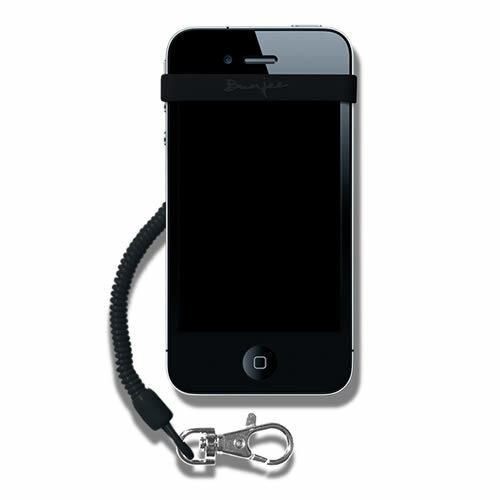 It simply slips over the phone and attaches to your jacket, belt loop or bag/handbag or similar by way of a coiled bunjee cord. Most people have accidentally dropped their mobile phone, but not everyone has their phone covered with insurance. So one small accident can cost a lot! Plus, mobile phone crime being on the rise securing your phone is the best option. With myBunjee® there will be no more lost, damaged or broken phones, it will keep safe what is for many one of their most important possessions! In a range of fabulous colours, this mobile phone strap not only stops your phone smashing to the floor, but looks brilliant!